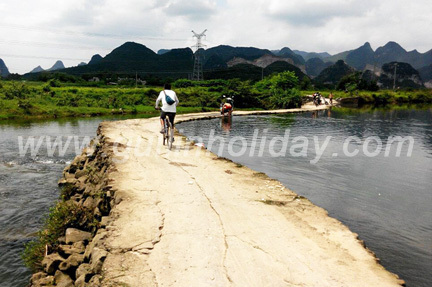 It is a perfect choice for solo travellers to join this budget China cycling tour to experience the real country road between Guilin and Yangshuo, and the hidden backroads around Xingping. We garantee the departure for everymonth when group number is over 2 people. This is a real biking route available with mountain bikes, designed for bike fans who are looking for diverse cycling trips. Cycle Type: Mountain bke leisure-ride across country or on well-paved road. Roads: Well paved concrete / asphalt roads. Dirt roads, Country tracks, Macadam, etc. Meet our tour leader and supporting car at 8:00 in the desiganated address with your luggages. Please take the necessary things(cloths to change, etc.) with you for today's cycling and leave the rest things in our supporing vehicle, they will be transferred to Yangshuo when we arrive there on the second day. The cycling out of the city of Guilin will be our warming up and testing time for bikes. 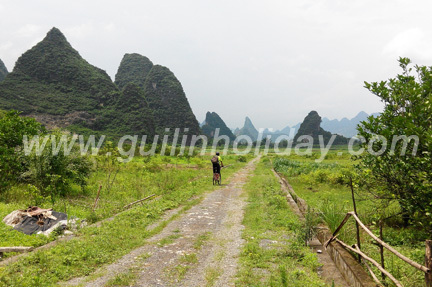 We will avoid the busy traffic and getting out of Guilin from the less busy trails of the eastern side. We will arrive Daxu ancient town after about one hour's biking and have a short rest there. After another 18KM leaving Daxu, a big cycling up will challange us. Using the low gear is benefit for both the bike and your health, it also makes the biking up much easier. Don't forget to take some photos of the Xitang reservoir during our cycling down of the mountains, it is so peaceful and beautiful. After conque the slopes and climbings near Xitang, the road are mainly down or flat. Riders will shocked by the astonishing Karst landscapes among the mountains, country roads, orchards, rivers and villages. A certain period on the undulating roads calls for experiences on how to save energy while cycling. Finally we arrives Xingping and still have many free time to visit the old town market, the scenery on RMB20yuan currency, etc. We will stay overnight at comfortable guesthouse in Xingping. Today's cycling is only 28miles and 45kilometers, the distance is not too far away but the content will absolutely attracts your eyes. We start today's biking leaving Xingping town from the main road between Xingping and Yangshuo, but we turns into the hidden backroad surrounded by the hills and mountains and leave our trace on the macadam and natural roads only finds in countryside areas. There will be some climbing on off roads and muddy roads today, but they are only of few distance, just perfectly to experience the advantages of mountain bicycle. We cycling through villages, fields, trails only trekked by local people and finally back to the main road till to Yangshuo. 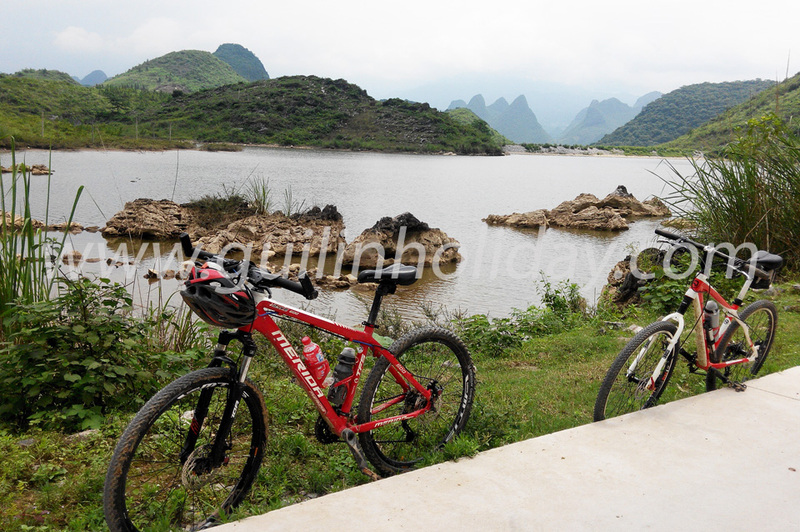 There will be about 10KM cycling on the well-paved provincial road and the rest of the distance are really valueble, regarded as one of the best sceneries in Guilin. We will arrive Yangshuo at about 2 pm in the afternoon and then take back all our luggages, return the bikes and say thank you and goodbye to your leader and friends. There are still enough time to enjoy the world famous county - Yangshuo. Booking and payment: Booking should be at least two weeks prior to the tour departure date and there will be no cancelation fee paid back if cancels within 1 week. 4. Two days accomodation at comfortable hotel or guesthouse. 5. Meals: listed as Breakfasts,Lunches,Dinners. 6. Luggage transffering to Yangshuo on day 2 or transfer back to Guilin with leader and bikes on private car. 5. We don't offer rider gears for cycling (helmet is excepted). I am interested in this 2 day bike tour around August 7-12. Do you have any tours between then? We are very glad to be of service to you. 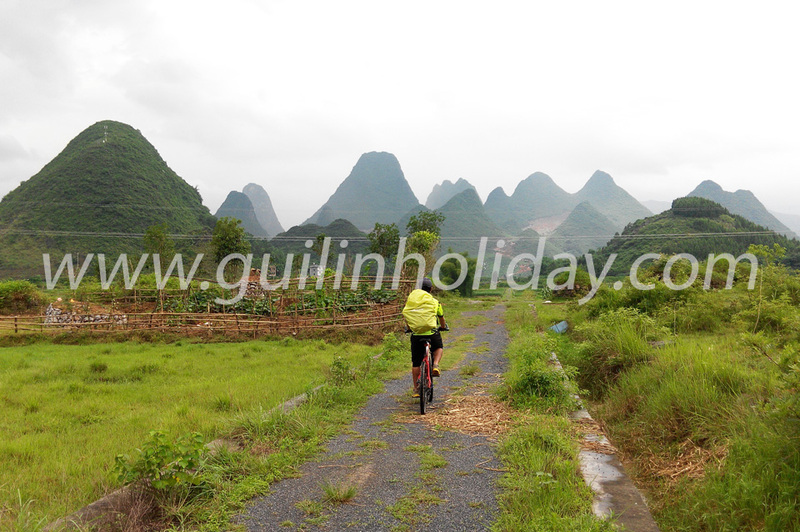 As to your bike trip in Guilin/Yangshuo, our cycling specialist will be in touch with you soon via email. What are your 2-day group tour dates for 2016? I'm specifically wondering about September. We are very glad to be of service to you. Regarding the join-in tour dates, our travel specialist will be in touch with you soon via email. Wish you a happy and blessed Chinese New Year of Monkey!